The first Saturday in August means different things to different Canadians. For many of us, it's the start of a three-day weekend. Although different parts of the country call it by different names, for most of Ontario, it's the Civic Holiday long weekend (with Monday being the Civic Holiday). I say most of Ontario as Burlington calls it Joseph Brant Day, Ottawa calls it Colonel By Day, Toronto calls it Simcoe Day, and Vaughan calls it Benjamin Vaughan Day. But the first Saturday of August is also Food Day. Over the past dozen years or so it has morphed from a beefy barbecue to support the Canadian beef industry to a nationwide celebration of Canadian food. Personally, I think it's a fitting combination of celebrations. It's a reminder of what, traditionally, it is to be Canadian: keeping an eye out for one another, and doing the right thing, and welcoming new people and ideas. It's also about celebrating Canadian food: from farmers who grow our food, to chefs who work with amazing local ingredients, to cooks who adopt and adapt foods to feed their families and friends. 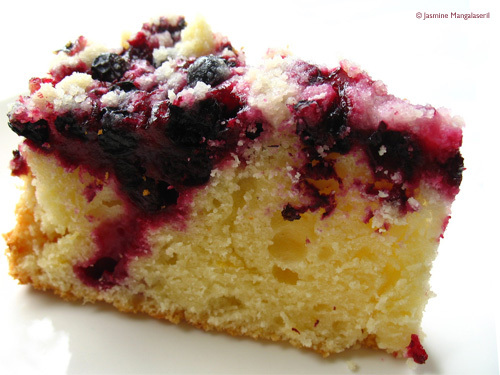 My offering for Food Day Canada is a very homey blackcurrant buckle--a lumpy-bumpy cake topped with fruit and a sweet topping. 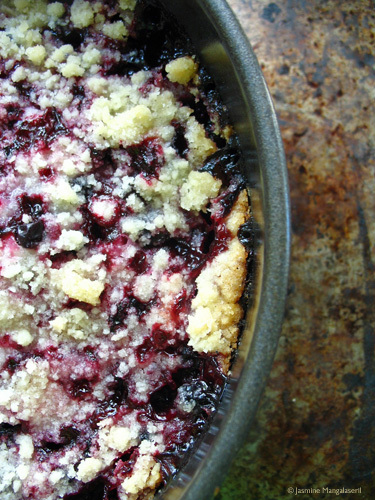 Depending upon where you are, you may call it a crumble. I've posted buckles recipes before, but they were both blueberry-based: peach-blueberry and lemon-blueberry. This one features locally-sourced blackcurrants. More tart than sweet, the small onyx orbs paired nicely with the tangy, lemon-scented buttermilk cake. Of course, if the cake is *too* tart for your palate, you can drizzle an icing glaze on top, dust the cake with icing sugar or snuggle a billowy cloud of ice cream or chantilly cream along side your slice. Preheat oven to 180C/350F. Butter and paper the bottom of an 20cm/8" high-sided springform pan. Rub the zest into the sugar, infusing the lemon oils into the sugar. Set aside. Start with the topping by rubbing together the sugar, flour and butter so everything is combined, but in varied pebbly sizes (from grains of sand to no bigger than a pea). Set aside. To make the batter, cream together the sugar, butter and oil. Beat in the eggs one at a time. Mix in the flour and buttermilk in the usual way (dry-wet-dry-wet-dry), scraping down the bowl's sides between each addition. If necessary blend in more buttermilk until the batter reaches a dropping consistency. Pour into prepared pan and level the batter. Tumble the blackcurrants on top, so they are evenly distributed on the batter. Cover the fruit with the topping. Bake for 60-75 minutes, or until an inserted skewer comes out with cooked cake crumbs clinging (it can be hard to tell as the skewer will have to travel through the cooked currants). The cake will begin to pull away from the sides and the crumble will be a light golden colour. Allow to cool to room temperature before serving. Serve, if you wish, with ice cream or chantilly cream. You probably wouldn't go wrong with adding more fruit than the two cups listed. You'll get more of bursted, somewhat jammy fruit top, and I can't think of how that could be a bad thing. Hi June-- thanks for stopping by. Buckles are a good, traditional cake--I like them as pudding, but also as something to accompany my afternoon tea/coffee. It's in the same family of baking as grunts and cobblers. This dessert looks amazing, I agree it is perfect! !